"Sarah and the Magic Piano" : This is the story of Sarah and The Magic Piano. This soundtrack has been written for you to play along with the story/film. An exciting way of put music to words/pictures. We look forward to including this with the teaching in our music studio at: www.maggiesmusic-ashvale.co.uk this month. A good hand position : This is an easy way to see how to place your hand on the piano to get a good hand position for playing music. 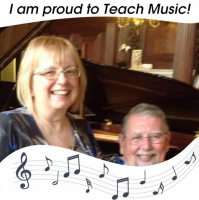 A lifetime of music - RiverSide Music - the studios we sold in Canada : Maggie and Peter George ran a family friendly music store and studios that supported local community needs in downtown Trenton. .
All ages - music/piano lessons with 'Wunderkeys' ages 3-5 years (preschoolers) : Starting music early, learning music skills and having fun - a good start for music and maths. Award for Business Excellence 2011 : What a wonderful surprise and humbling experience to be awarded the top trophy for 2011 from the Quinte Business Achievement Awards, Ontario, Canada. Wonderful support from the local people and local community. Great place to do business! Flea Waltz (Chopsticks) : A favourite for all beginner students. When you see this music, you will probably be happy that someone has shown you how to play this by ear/sight! Enjoy!! Helpful leaflet to prepare children for exams : Examinations can be stressful. This leaflet helps with the nervousness. An easy read! Learning piano can start at quite a young age! : This young man is certainly enjoying playing the piano! Very gifted. Map : This is a map of Ash Vale made by a parishioner at St. Mary's Anglican Church. News: Back to the UK to retire... still teaching music, a passion : Maggie and Peter will be missed by the local community and churches as they played for Sunday services at 2 churches each weekend! Student practicing 'Let it go' from Frozen : This student is practising with her mum joining in. How fantastic for this family to be so happy to share in this musical journey.